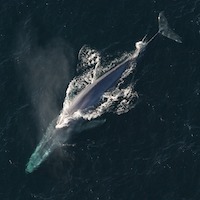 Description: Blue whales (Balaenoptera musculus) are listed as Endangered under the U.S. Endangered Species Act due to population depletion from commercial whaling. In the eastern North Pacific, ship strikes remain the largest threat to the recovery of this protected species. Static management approaches along the U.S. West Coast are being implemented to direct traffic into designated shipping lanes, yet whale distributions are dynamic and may shift in response to changing environmental conditions, necessitating integration of dynamic management approaches. We developed a dynamic, near real-time blue whale distribution model with the aim to mitigate ship strike risk in a project called WhaleWatch. This model is now being further refined by examining potential changes in predictive skill by developing distribution models using a) daily surface and subsurface variables from a data-assimilative regional ocean model compared to monthly remotely-sensed environmental data, and b) an ensemble modeling approach with multiple datasets (satellite tags and ship surveys) and methods (Generalized Additive Mixed Models and Boosted Regression Trees) compared to a single-model approach. Dynamic, high-resolution species distribution models with strong predictive performance are a valuable tool for targeting management needs in near real-time. This general approach is readily transferable to other species and spatial management needs.